The chemistry behind a molecular motor. The four wheels? The thermal (Δ) reaction is defined by the transition state. The remarkable feature noted by Woodward and Hoffmann was the stereospecificity of pericyclic reactions. In this example, the breaking σ-bond in the transition state is defined by its connectivity to the top face of one terminus (the red arrow) and the bottom face of the other terminus (the green arrow). The technical name for this is antarafacial, and this is also associated with a C2 axis of symmetry for (this particular) example. The modern theoretical explanation for this is a Möbius-aromatic transition state resulting from a total of 4n circulating electrons (note the methyl flags waving). IRC for Electrocylic ring opening of dimethyl cyclobutene. Click for 3D. The concept of aromatic (or anti-aromatic) transition states is a very useful one for thermal reactions, but this transition state becomes a little less helpful for the photochemical (hν) version. Instead, a new concept is introduced of a conical intersection between the (thermal) ground state and the (photochemical) excited state. Think of it in terms of the famous painting showing God (in an exalted state) touching Adam (very much on the ground). The conical intersection is the geometry at which a photochemically excited molecule leaves the S1 state and returns to the ground S0 state. It is this point that determines the resulting stereochemistry. That for dimethyl-cyclobutene (casscf(12,8)/6-31g(d,p) model) is shown below. 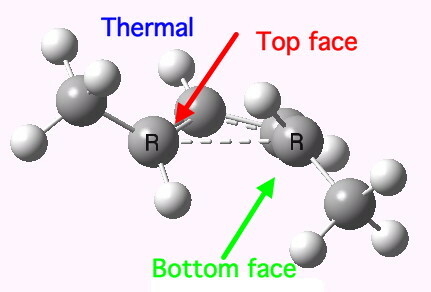 On the right hand side of the molecule, the σ-bond region looks very similar to that of the thermal transition state shown above; the bond is associated with the bottom face of the molecule. However, the left hand side is rotated clockwise relative to the thermal reaction, and this rotation now presents the bottom face for connection to the σ-bond (rather than the top face as for the thermal case). 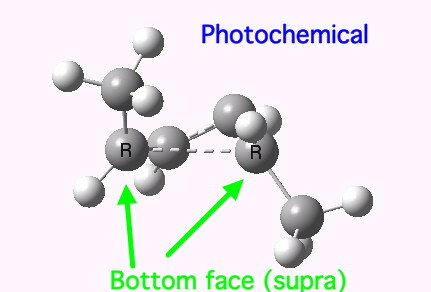 The σ-bond is thus connected suprafacially. When the rules are presented to students, the photochemical case is often defined as the inverse of the thermal rule. Thus for the same electron count (4n in this case), a thermal reaction is antarafacial and the photochemical one suprafacial. A more fascinating question is whether the aromaticity associated with the key geometry should also be inverted. Thus the thermal reaction corresponds to a Möbius-aromatic (topological linking number =1π) transition state. Should the photochemical reaction rule be inverted to refer to a Hückel-aromatic(topological linking number = 0π) conical intersection? I am unaware of any formal studies of the aromaticity of conical intersections specifically, but it would be nice to know if this analogy has any reality. Watch this space. This entry was posted on Saturday, November 26th, 2011 at 11:26 am and is filed under Uncategorized. You can follow any responses to this entry through the RSS 2.0 feed. You can leave a response, or trackback from your own site.